Kyocera TCL Solar has completed construction of two floating mega-solar power plants in Kato city, Hyogo Prefecture, Japan. The joint venture company formed by Kyocera and Century Tokyo Leasing had inaugurated the project in March. The company has stated that the power plants at Nishihira Pond and Higashihira Pond will be jointly generating 3,300 megawatt hours (MWh) a year. The electricity generated will be adequate to power about 920 households. 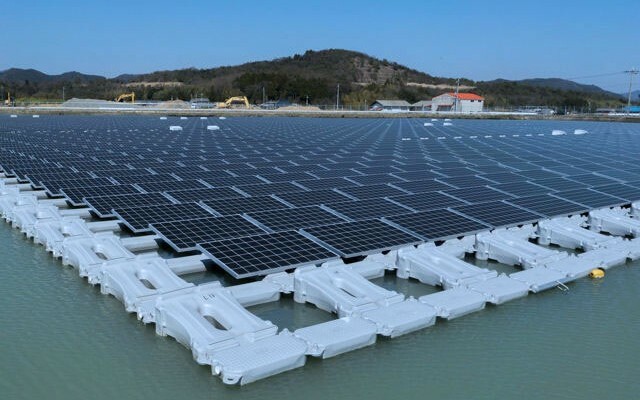 Kyocera TCL Solar has used Ciel et Terre’s Hydrelio floating solar platforms to develop both installations. These have a proven record of success in operation in France, according to the company. Besides, Ciel et Terre’s floating platforms are recyclable, utilizing high-density polyethylene which can withstand ultraviolet rays and corrosion. Kyocera TCL Solar is also developing a 13.4-megawatt floating solar power plant on the Yamakura Dam reservoir, Japan. The Kyocera Group will be responsible for the supply of solar modules and related equipment in addition to construction, operation and maintenance. The project will consist of nearly 50,000 Kyocera modules installed over water’s surface covering 180,000 square metres. The plant will generate around 15,635 megawatt hours of electricity annually, which should be adequate to power almost 4,700 homes. The generated electricity will be sold to Tokyo Electric Power Company. The plant will be the largest floating solar installation in the world, once completed by the scheduled time of March 2016, the company claimed in a recent statement.